It’s hard to believe SmackDown Live superstar Naomi is approaching a decade working with WWE. And her husband Jonathan Fatu, known to fans as Jimmy Uso, has been there for most of the way as she transformed from former Orlando Magic dancer into pro-wrestling champion. Their relationship continues to be chronicled on the E! reality show Total Divas. The “Feel the Glow” personality has gotten used to the cameras, even when she butts heads with her fellow WWE spouse. In recent episodes of Season 8, Naomi is missing family in Atlanta and wants to spend time with Jon outside of Pensacola. This leads to some uneasy marital discussions. “Everything that comes with our lifestyle now is not going to be perfect and easy all the time,” she said. “We’re trying to understand each other’s wants and needs at this point in our life because we have both changed as people. That’s what I’m learning and what we are trying to figure out in our marriage right now. "You’re getting to see that unfold on Total Divas. It’s real, what is going on and where we are. Hopefully, it can help out other couples and others who are watching can relate because they are going through similar situations. “What we put out is real, and what we put out is with no regrets. It’s very important to see that as much as we love each other, there are flaws. It’s a constant fight to get through life. Naomi talks to us about the E! reality hit, being one of the competitors in the first-ever Women's Royal Rumble match, and more. Naomi learns a lot about herself from watching previous episodes. The long time Total Divas cast member sees instances when she got swept up in the heat of the moment. It’s been a unique kind of therapy. “You are just reacting and emotional. You’re not thinking. So sometimes I would watch stuff and not even remember why I was so angry,” she said. 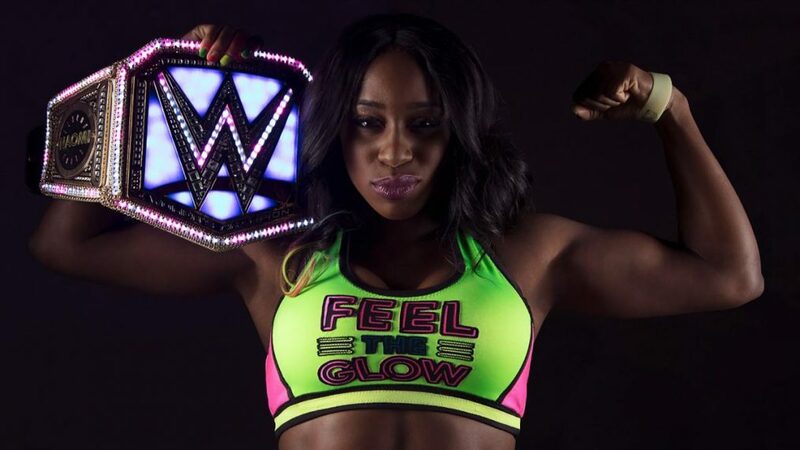 Outside her personal life, Naomi is proud to be part of an overall push for female empowerment within WWE. In 2017, the athletic performer became the first African-American SmackDown women’s champion. She followed it up this year by participating in the inaugural women’s Royal Rumble and ended up winning the first-ever women’s battle royal at WrestleMania. “Our locker room is so positive,” she said. “We are all focused on the same objectives, and that’s equality for women. Changing the perspective. We want it to be the norm for us to get TV time and for it not to be a big deal if a woman is in the main event. We want the same opportunities as the men, and we’re still focused on proving that. Another milestone was marked in October when WWE presented the first all-women’s Pay-Per-View Evolution. Naomi hopes the historic show isn’t the last of its kind. “I think with as many Pay-Per-Views as we have, I think this shouldn’t be a one-time thing,” Naomi said. Attention turns to Survivor Series as Naomi stands alongside Team SmackDown against Team Raw. She is happy her recent tag partner Asuka also featured in the five-on-five elimination match. In her eyes, they’ve only scratched the surface of their potential working together. “A dream of mine is that if and when we get the tag team titles, I want me and Asuka to be the first to hold them,” she said. “I think where things stand right now, you’re seeing a different side of her. We all know Asuka is probably the baddest women, toughest women and most talented. I think she is truly talented. I’ve been learning so much from her. “And as cute and pretty as she is, when she gets pissed off or mad, she can take down any woman or man. I think she is the best. That’s who I want on my team and my corner. With Charlotte filling in for an injured Becky Lynch against Ronda Rousey, Naomi has a suggestion for the blue brand’s team captain. Total Divas, Wednesdays, 9/8c, E!